Sometimes a revolution in technology just happens when people least expect it. There's this new product that has been rocking the mobile computer world in a way that can only be called: "infectiously innovative". Possessing an unlikely name: "the Digimemo", the technology was quietly the hottest product of 2006. Released in December 2005, the DigiMemo 6920, also known in retail circles as the A692, digitally records handwriting written on ordinary paper. Installed in a DigiMemo 6920, a writing pad 6 inch by 9.1 inch in size, is simply written on with a fairly ordinary ink pen (with a special DigiMemo transceiver installed within it). One simply takes notes, doodles, draws or makes charts, page after page up to 999 pages. The wireless Digital Pen simultaneously puts handwriting onto each page of the pad as the user writes, and magically sends signals to the DigiMemo's memory, who's internal, artificially intelligent system translates the Pen's movements and inking into a drawing stored electronically on internal flash memory drive. A standard Cross Ink Cartridge or equivalent, provides excellent writing texture. That means, a DigiMemo can digitally record everything you write in ordinary ink on paper, and store it on flash drive, flawlessly. Yet, it doesn't stop there. The USB cable provided with the DigiMemo 6920 allows support software under Microsoft Windows XP or 2000, to upload hundreds of your handwritten pages of notes and drawings, once you're done with them. Stored on a PC C: or other drives, in eBook format, these "collections" (alternatively stored as JPEG or GIF graphics) allows users to keep meaningful archives of all your notes, drawings and chartings. A second, optional package, MyScript Notes, is then used to export any of your myriad handwritten pages using Handwriting Recognition Technology, converting them into Typed Text. Then, at the touch of a button, professionally typed text from handwriting pages are exported into Microsoft Word documents where users can work with them further with Microsoft Office. Or, they may be saved in Rich Text or other forms common to PCs. Starting at only $85.99, the CompAmerica DigiMemo 6920 took the market by storm this past year, because of exceptional mobility, weighing in at a svelte 1.2 pounds with batteries installed. Imagine dropping a $2,500 Tablet PC, you're out $2,500. Dropping an $85.99 DigiMemo, usually doesn't break it, but if it does get smashed, say, run over by a local UPS truck, UPS can ship a new one for under $100. Here, a product that does the larger part of the work of a Tablet PC, is a quarter the weight of a Tablet PC. Here, a product with four times the writing surface of a typical Pocket PC, yet without the potential loss of several thousand dollars versus a Tablet PC, or five hundreds of dollars in the case of the PPC, if dropped, stepped on or lost. It has become 2006's hottest product. Because: it's durable and very well constructed, easy to use, and doesn't empty the pocket book. Thinking ahead, CompAmerica's computer scientists also wanted to address the Graphic Artist, Fashion Designer, Industrial Engineer, Scientist, or anyone else who needs a very large canvas on which to write, draw or design. So as to provide such a Full size Desktop Edition DigiMemo, yet still reasonably mobile version, CompAmerica is now bringing a second model, a "big brother" for the DigiMemo 6920 so to speak: the new DigiMemo L20 (a/k/a, the "L2"), which will arrive on our shores sometime in December of 2006. CompAmerica is taking orders in advance for the new product, at CompAmerica's DigiMemo.com Store. Starting at "some price below its MSRP of $149", the larger DigiMemo L20 addresses the needs of Graphic Artists, Cad Cam designers, Legal Practitioners, Court Reporters and those needing to take notes larger in a larger than 6x9 page size, by building around the standard 8.5 inch by 11 inch paper size commonly used in America. An A4-sized "Euro" edition will be available in Europe A4 is more common than America's 8.5x11. While a bit more expensive and physically larger and heavier than the DigiMemo 6920, the DigiMemo L20 is described as "The DigiMemo for those who have Engineering, Industrial, Government, Graphic Arts, Cad Cam or Desktop use in mind." "Some people work their ideas out in a space the size of the back of an envelope..." stated CompAmerica Chairman, Dr. Jack A. Shulman, a noted past inventor of Pen Input Interpretation Software Algorithms and Vector to Rasterization Software. "Some work like Michaelangelo, and want the entire ceiling of the Cistine Chapel. The DigiMemo 6920 is for those who think big in small spaces, back of the envelope thinkers, who put their ideas to work quickly, or work in a personal, close to the vest manner. The DigiMemo L20 is for those who want the Chapel ceiling, plodding, long term and expansive, very public." c) It will also support an "online interactive mode" of operation as a Tablet, with the internal handwritten pages of the DigiMemo visible under Windows XP, 2000 (and Vista), thus enhancing any PC via USB Port. It will continue to support mobile use with "upload mode" as the 6920 does. d) It will store three Ink cartridges, and have a Pen Storage recess above the Pad. 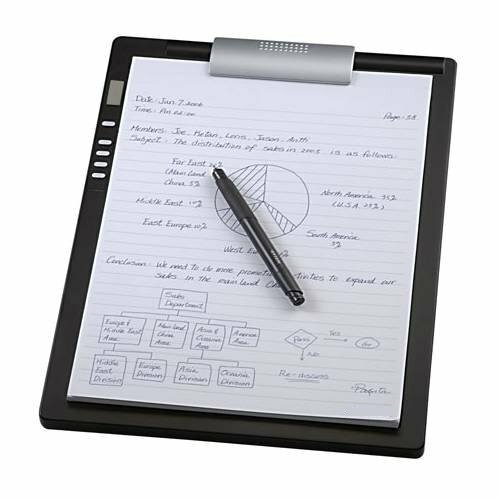 The extra surface space for writing and drawing (and tracing) afforded the user of the DigiMemo L20, as well as its interactive "online mode", is thought of as offsetting to its slightly reduced mobility (due to its larger size and weight than the DigiMemo 6920). For those on the go, wanting an unobtrusive yet spacious DigiMemo, the 6920 is still the way to go. For those with big writing, big drawings, Cad design, or similar requirements, the L20 will be the thing. As with the DigiMemo 6920, the DigiMemo L20 will be offered with a Portfolio carry bag as an option, with ample storage for accessories. MyScript Notes, Evernote and DigiMemo Manager are fully compatible with the new model. As always, CompAmerica will offer its unique Standard Shipping or Shipping with Platinum Protection options, a hassle free shipping warranty that protects buyers from problems. DigiMemos are finding their way into the hands of artists, writers, lawyers, doctors, patients, teachers, students, truck drivers, political leaders, the military, international import exporters, you name it. Quietly, a revolution is taking place that represents significant time savings, enhanced means to collect data, and a friendly, light weight product that will insure you never forget another name, number or event you attend. An "infectiously innovative" product that cures what ails. Forget lengthy keyboard sessions to write your next book. "If Stephen King calls me, any time soon, I'll send him one entirely for free!" stated Shulman, who recollects King's at the time 'revolutionary' purchase of an early Wang Word Processor back in the 70's, adding: "And I'll even overnight it to Bangor, when they arrive in December." To order: CompAmerica's DigiMemo.com Store. CompAmerica is a 30 year old leader in technological innovation, who makes PCs, Laptops, Servers, and Software, and sells over 250,000 different computer related products. For more information, contact the company. 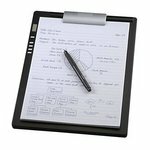 the DigiMemo L20The new, fullsize Desktop DigiMemo, has mobility, durability, flexibility and popular 8.5 inch by 11 inch paper size.